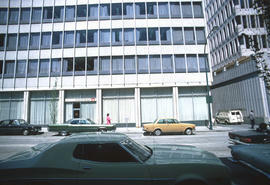 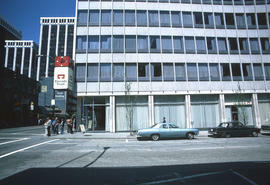 Image shows street level portion of the Bank of Canada Building (900 West Hastings Street). 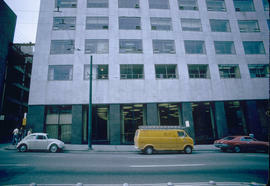 Photograph shows the Canada Trust Building (901 West Hastings Street). 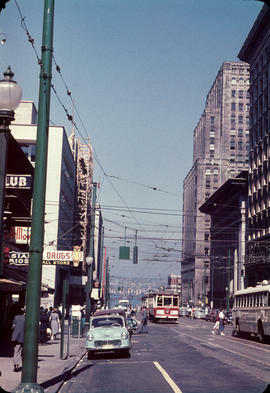 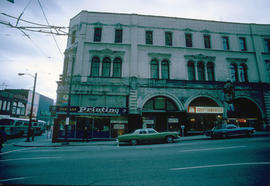 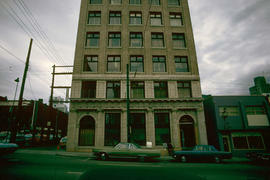 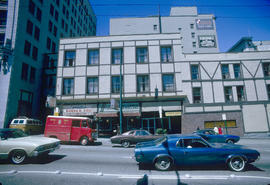 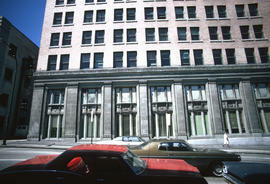 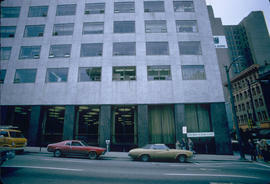 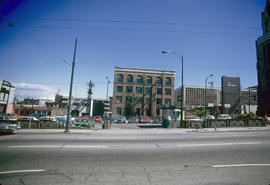 Photograph shows the Canada Trust Building (901 West Hastings Street) at the corner of Hornby Street. 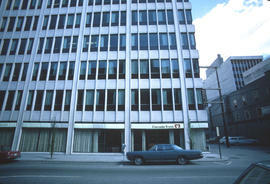 Image shows the east side of the Bank of Nova Scotia Building at Seymour Street and Hastings Street. 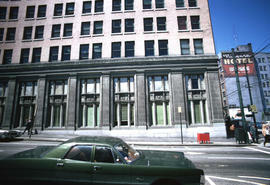 Image shows east side of the Bank of Nova Scotia Building at Seymour Street and Hastings Street. 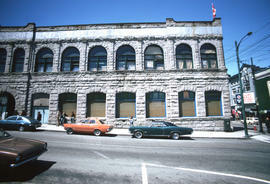 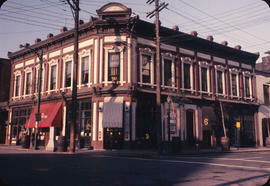 Photograph shows a 2 storey office and retail building on Columbia Street in New Westminster. 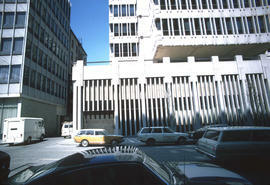 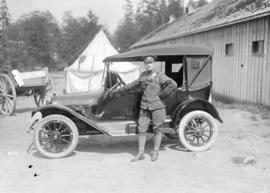 It also shows cars parked in front of the building and the width of Columbia Street. 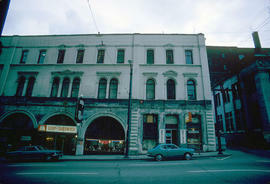 Photograph shows entrance to Miller Brothers Sailmakers at 505 Hamilton Street in a large stone building. 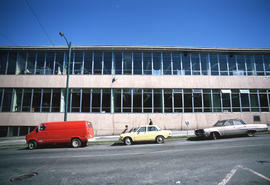 Sign for the Army, Navy & Air Force Veterans, Vancouver Unit 20, 300 Pender Street is visble on the corner of the building. 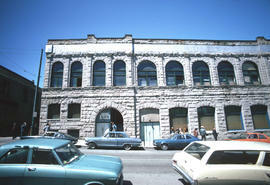 Photograph shows entrance to Miller Brothers Sailmakers at 505 Hamilton Street in a large stone building. 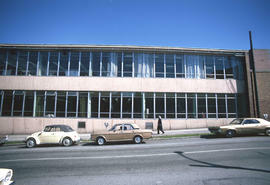 Images show west side of Vancouver Vocational Institute building. 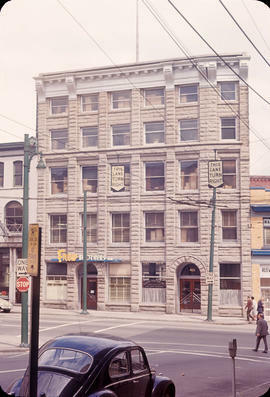 Image shows a portion of the east side of the Pender Building (402 West Pender Street). 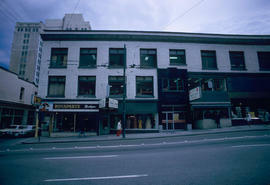 Image shows a portion of the west side of the Pender Building (402 West Pender Street). 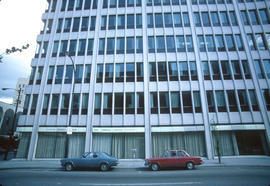 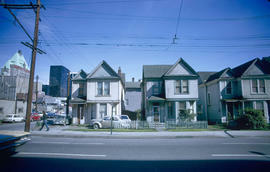 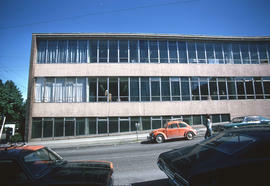 Photograph shows the Nesbitt Thomson Building (890 West Pender Street) from the west side. 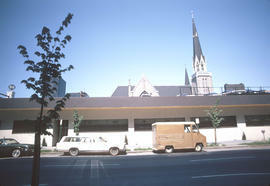 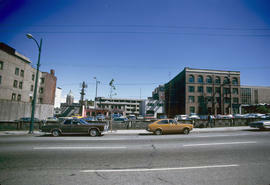 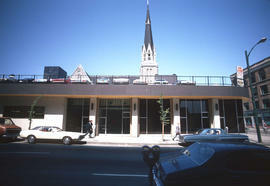 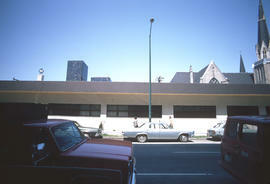 Image shows Metro Parking building (444 Dunsmuir Street) from east side (with Holy Rosary Cathedral in background). 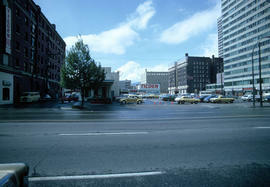 Image shows a parking lot at Burrard & Alberni, and buildings in the background including the Ritz Hotel and the south side of the Burrard Building. 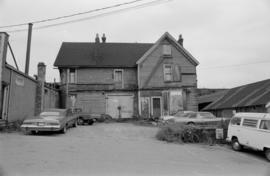 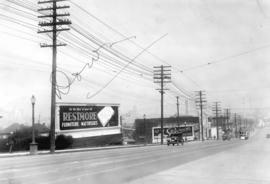 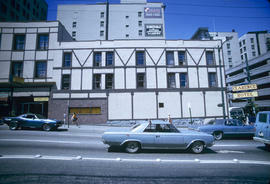 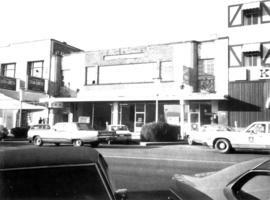 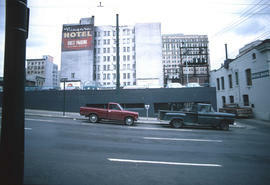 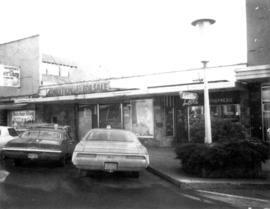 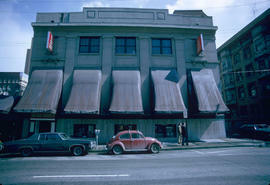 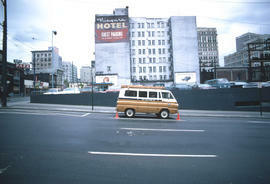 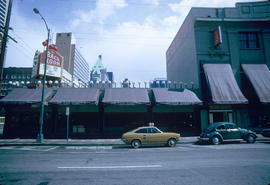 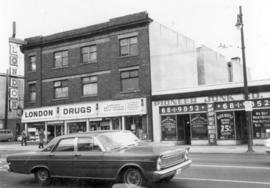 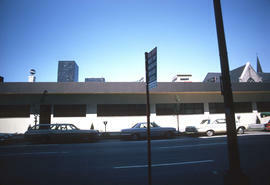 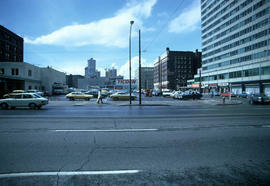 Image shows Oil Can Harry's cabaret (752 Thurlow Street) and a rotating sign for "The Back Room". 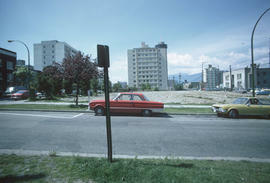 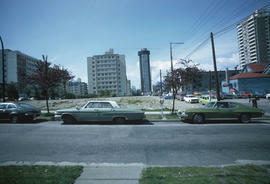 Image shows vacant lot in foreground, portions the Nelson Rooms and Nothingham Apartments in the 1200 block of Robson Street and the east side of the Sheraton Landmark building. 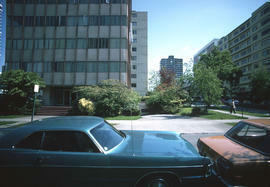 Image shows vacant lot in foreground and the back of the Nelson Rooms and the Nothingham Apartments. 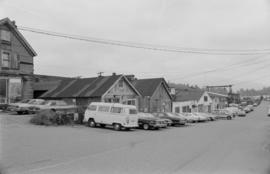 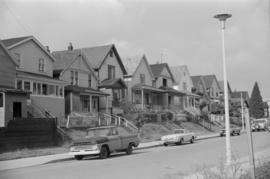 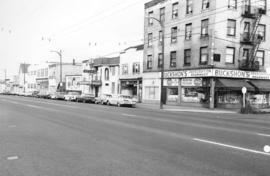 Photograph shows south side of the 8oo Block of Hastings Street as viewed from the north west including Buckshon's Pharmacy, Dean's Grocery, the Hastings Auditorium and the Rice Block (404 Hawks Avenue). 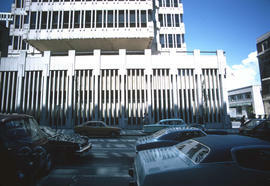 Image shows north side of the Westview Towers apartment building at 860 Jervis Street and apartment buildings in the 1200 block of Haro Street.